After months of anticipation and fundraising, TAMUT@NTCC Education Club members set off to the west coast. 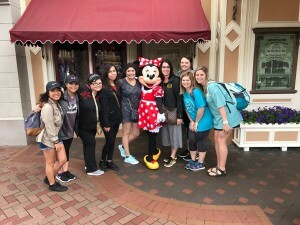 Seven members, with faculty advisors Laura Currey and Kelly Coke, attended the ASCD (Association of Supervision Curriculum and Development) conference in Anaheim, California March 24-28. This conference is perfect for preservice teachers as it focuses on diverse aspects in the education field. The students were able to choose sessions based on their interests in the curriculum and development process. In addition to the education attributes of this trip, the experiential learning that took place for these students was unmeasurable. 3 of the 7 students had never flown before, and 4 of the 7 students had never seen the ocean. The final day of the trip following the conference was another first for all the students. 14 hours was spent at Disneyland and California Adventure park which was within walking distance from the convention center. This was a great way for the club members to spend time together outside of the classroom setting.